Eight months. Just read that again and take it in. I know I need to. I can't believe it's been eight months already. That time has just flown by! The last few months even more so, since we had three holidays back to back, in December, February and March. Anyway, it's been a while since my last update on how life in general is over here in Hong Kong, and I'm sure you're all itching to know how things are (well, you probably aren't really, but if you clicked on this post in the first place then you must be at least vaguely curious). Overall, life is pretty good these days. I feel very much settled here, I know how the city works, how to get around, where to go for whatever I need. As much as I enjoy exploring new places, there's something comforting about being in familiar surroundings, and Hong Kong is no longer a strange, unknown place to me. While home will always be home, Hong Kong feels like a second home now. While I was travelling in my Chinese New Year and Easter holidays, I had a great time, but towards the end of each trip, I got that feeling of being ready to be back somewhere familiar. I always got this feeling when I was younger, on family holidays - after the 2 weeks, I was quite happy to get home again - and for these trips, I was ready to get back to Hong Kong. Home home would be even better, but Hong Kong will do for now. Of course, I still do get bouts of homesickness, which were considerably stronger while I was in Cambodia and the Philippines, and I look forward to going back (whenever that may be - more on that in a bit), but thankfully returning to Hong Kong kept those at bay a bit more. The city is so crazy and busy, and I don't think I'll ever enjoy the rammed streets and noise late at night - or even mid-afternoon, since all I can hear from outside as I type this is cars honking and honking and honking. But it's also such a unique place, unlike anywhere else in the world, and I love that I can feel comfortable even in the middle of the chaos. I'm no longer the lost, uncertain newcomer, who might as well be a tourist; now, although I'm still a newbie by the standards of others, I am confident as I walk the streets, knowing how the city works, and I am very much part of the expat community, not just a visitor. I wasn't sure that I'd come to like Hong Kong that much, and I've surprised myself with how much I do enjoy living here now. It's such a diverse place, both culturally and geographically. The Chinese locals constitute the majority, and while it is quite a Westernised city, I've been able to experience plenty local culture too. But on top of them, there are people here from every corner of the globe, making this such a melting pot of cultures. 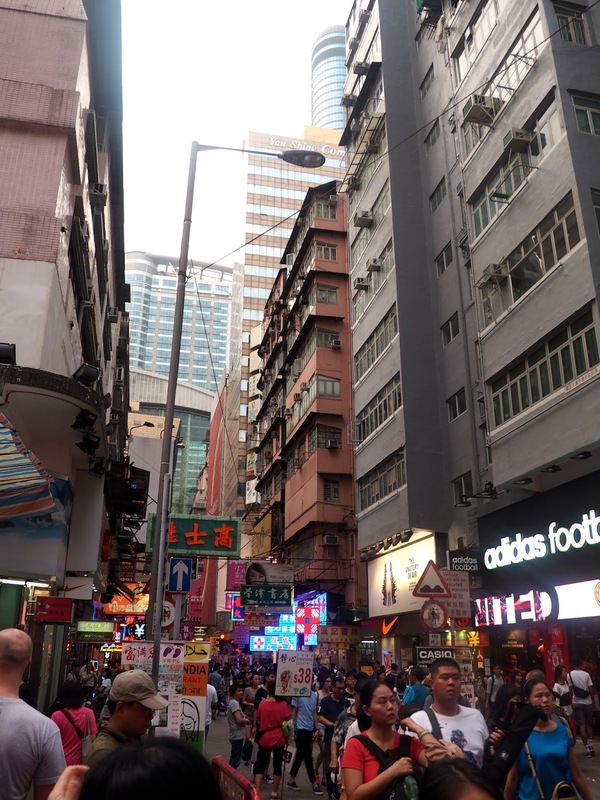 And while I may live in one of the densest areas of the planet - seriously, there's barely room to inhale in Mongkok - it's just a half hour bus ride to a country park or a beach or an island, away from the streets and the traffic and the noise. And I've got my gang of friends here, which makes my time off of work far more enjoyable when we can go off and explore new corners of the city together. We're actually starting to run out of sights to see, but there's a million and one restaurants and bars and hidden gems still waiting to be discovered. Work is much the same as before. I no longer feel the new girl, thank goodness, and I get along well with all the other staff. Obviously, there's always going to be a language barrier, but we get by, and I do have conversations with many of them far more now than I used to. The other language teachers are those I spend the most time with, and the ones I still turn to when I am unsure about things, and they're always very helpful. I've even met up with one of them on nights out in LKF a few times, and we've gotten spectacularly drunk together! I'm always nervous when I start new jobs, and very careful about following rules and working hard, and now, while I still work hard of course, I feel more relaxed and laidback about things, and I know when we bend the rules a little. I spend less time in the office these days too, which the headteacher seems to have no problem with as long as I'm still doing work (i.e. colouring. Yes still. These books are taking forever! ), and it means I'm free to pop in and out of classes more to see the kids and chat with teachers, and help out a bit. The kids are my reason for being there though. I absolutely adore those nursery classes, and I know them so well now - I know their personalities, their learning capabilities, how to handle them. And, without sounding too arrogant, they love me. I get so many hugs and kisses and high fives all day, I hear my name shouted down the hall, they come running up to me after the holidays. There's two kids that we all refer to as my babies, one morning and one afternoon, as they want nothing more than for me to pick them up and play with them for a while - one even refuses to be passed to anyone else once I have him, crying if someone tries to take him. I'm already dreading having to leave them all at the end of the year. Because while the job is good in many ways, it's not ideal. I could extend my contract, but I will not. I'm sick of working Saturday mornings, doing next to nothing most weeks. I'm sick of all the extra events, that require ridiculous amounts of preparation (these are kindergarteners remember!) and are landing on Saturday afternoons more and more frequently, with no extra pay or time off to compensate. I'm sick of knowing that I'm overpaying for a flat that's crumbling at the seams (seriously, there's so much water leaking down one wall, and nothing has been done about it for months now) and that the agency is taking a large chunk of my salary. And now, I'm in the home stretch. Eight months gone, and just three to go. Summer still seems a while away, since we have no more holidays between now and then, but it does seem a hell of a lot closer than it did before the last holiday! So now I have to start thinking and planning and deciding again. Not things I enjoy doing at all - job applications and interviews are seriously one of my least favourite things ever - but things I need to do nevertheless. So what's next? I don't yet, not for certain at least. I've decided that I want to stay in Asia for another year, since the only places I've seen outside of Hong Kong are Cambodia and the Philippines, and there's still loads more on my list. Where I stay in Asia remains to be seen. Naturally, teaching again is the easiest way to stay, and I now have a year's experience behind me. I've loved teaching kindergarten, and would happily stay with that age group, but I am applying for jobs in other age ranges too. And I could so very easily stay in Hong Kong for another year. Yes, I'd have to sort out things like a new flat, another working visa etc, but I'm so comfortable here and familiar with the city, that it would be very easy to stay, especially since many of my friends are staying another year too. But at the same time, I came to Asia to travel and see more of the world, and while Hong Kong still has secrets, I do feel like I will have covered it pretty thoroughly by the summer, and it might be time to move on and explore somewhere new. I feel like I'd spent next year re-visiting a lot of places if I stayed. So for now, I'm applying to jobs both here, and in other countries, primarily South Korea and Japan for the moment. And then I'll wait and see if I get any offers, and weigh those up to decide where I ultimately end up next year. It's still early days in this whole process, so it might be a while before I make that decision - and then of course, there will be many more arrangements to be made, whether I stay or go. So life certainly isn't slowing down for me anytime soon. The future does still scare me a lot, but it's also exciting. Sometimes I wish I could fast forward to being settled down, most likely back home, with a good job, a house, and all that jazz. Sometimes I do get sick of always moving, always having to decide what's next. But then I remember that I'm only 22, and I'd lose my damn mind if I was settled down already. I still want to explore and seek out new adventures for a while longer, so even though it gets scary and incredibly stressful, it's worth it. What's next? I don't know! And that's a pretty good thing right now.